A high-pressure misting system is one of the most effective and efficient methods for cooling outdoor patios. The process is this. Operating at pressures of 1000 psi+ Koolfog produces micron-sized water droplets that, while evaporating and turning to vapor, removes heat from the air, cooling the surrounding area. The dry fog produced by a Koolfog system reduces outdoor temperatures by as much as 35 degrees Fahrenheit, which makes even 100+ degree days comfortable. This ensures that outdoor square footage is utilized and producing revenue. Guest comfort is also a significant factor in generating new customers. It is a well-researched fact that when customers have an exceptional engagement with a restaurant, they tend to leave reviews on online platforms such as Yelp and will tell friends and family about their experience. They may even take to social media to share their thoughts, which can influence an even wider audience. When guests have a mediocre experience, they are not likely to feel it is worth sharing. However, when a restaurant adds an extra element of comfort or luxury to a dining space, guests leave impressed and satisfied. According to NextRestaurants, a customer can be valued at about $700 a year if they are a repeat customer. There are many ways to evaluate return on investment. One direct impact of inclement weather on restaurants is reducing their ability to turn tables. In a full-service restaurant with an average check per person of $15 to $24.99 and a seat turnover time of 1 hour, a patio dining space of 10 four-seat tables generates revenue of up to $2,998 per 3-hour lunch period. 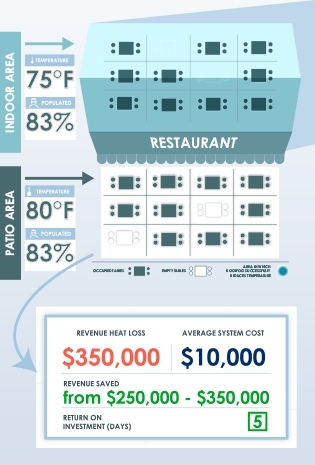 At full capacity, during an average summer, a restaurant could lose over $350,000 in revenue over a 4-month span if they lose those seats to weather. Considering a Koolfog misting system may cost under $10,000 for this size space, the return on the initial investment is realized in a very short period of time.